Jacob van Loon is a 26 year old painter and designer living in Chicago. His work carries a strong design sensibility, focusing on the synthesis of digital and traditional media to complete a visual idea. 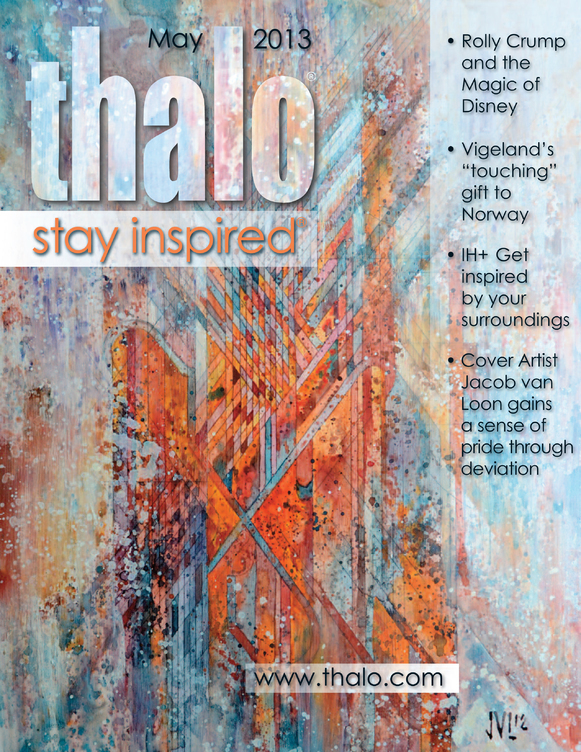 thalo: What inspired you to create this month’s cover artwork, Into Lists? How did you create it? Jacob van Loon: Into Lists was a commission I received from Meredith Turits, who gave me free reign to design something that was a continuation of my previous work. It still became a departure in some ways. My paintings focus on stories in American history — how the treatment of success and failure is addressed through a person’s desire to maintain or erase a story. Being commissioned for Into Lists gave me an opportunity to explore a more personal side to the research and analysis I usually do for concept building. Like my other paintings, it was created with a mixture of graphite, watercolor, and acrylic, which presents both a lot of advantages and challenges in the layering process which is important to my work. th: Is there a piece that you are most proud of? JVL: I identify parts in completed works that are successful, and parts that need more consideration. I still don’t know how to “finish” a painting, so that critical approach is always rolled into the next piece or idea. I don’t have a lot of time to start something over if a piece were to “bottom out” on me while working on it. I gain a sense of pride through deviation; whenever I explore a new method or concept and it’s realized physically, whether or not it’s a straight success. It can be more difficult to try something new than some artists are willing to admit, I know I certainly feel accomplished when new things happens in my own work. th: What is the biggest challenge you face in being an artist today? JVL: All of my work is anchored by a genuine interest and pursuit of design. The dialog between art and design today remains mostly argumentative, but I’m most influenced by times in art history when art and design were realized in unison, like how the Constructivists and Bauhaus treated art. My interests are leading me to seek a career that allows me to address art and design on the same plane. This year is also about getting a good idea of what Chicago has to offer me, and what I have to offer Chicago in that respect. th: What advice do you have for others who are hoping to pursue careers in the arts? JVL: Through late high school to the end of my undergraduate career, I took classes at four different schools. The only people I saw develop their craft and repertoire at any institution were those who not only listened to their teacher’s criticisms, but had enough drive to progress on their own terms outside of the classroom. If the world doesn’t stop working, then an artist cannot stop working. Time is a resource. The reason a lot of artists I observed in school were late for assignments or struggled to meet other deadlines is because they gave a lot of time to parts of their lives that they couldn’t make function with art. The type of student who knew where the best bar was in town, but couldn’t tell you how to find the campus gallery or museum. I wish that was an exaggeration, but it’s not. Utilize social media to the fullest extent. Find the share sites that work best for you, and outside of maintaining a current online portfolio, branch out to other networking websites. Make sure your online presence is consistent and synchronized. th: What is next for you? To learn more about Jacob van Loon, please visit his website.